It was V who noticed a big sign on the window of one of the Jersey Mike’s restaurants: “Gluten-Free Bread Available.” Do you have Jersey Mike’s near you? They make yummy sandwiches. And let me tell you, it’s not common that a sandwich place will have gluten-free offerings. Naturally, we had to check it out. We have a few locations near us. I was rather skeptical as V insisted we visit one of them. As we got in line, I noticed this sign! Photo is a little blurry, but you are looking at very clear and detailed instructions on how to prepare a gluten-free sandwich in a way that would minimize chances of cross-contamination. As we placed our order, our expectations were met and exceeded. Without us even asking, staff informed us that they would be preparing V’s sandwich in the back using fresh ingredients that were not part of the “buffet” set up at the counter. They had a couple of different sizes of bread available. They knew very well what ingredients were gluten-free and uncontaminated. We had to wait a little bit longer for V’s sandwich but it was completely worth it. It was delicious. We went back to this location several times and had excellent experience every single time. Instant winner, shiny A+! When sometime later we came to a different location, we assumed that we would have a similar experience. We proceeded with our order without asking any questions. Big mistake. The staff started preparing V’s sandwich right at the counter. “Don’t you do it in the back, separately?” They looked puzzled by our question. “No, we change gloves and put a clean piece of paper on the counter.” Oh crap. They were rather clueless about cross-contamination. V was very hungry, so we decided to risk it but were watching them closely. On at least one occasion, the staff set the sandwich on the counter, then immediately realized it, picked it up right away and placed it on the paper. If my looks could kill he would have dropped dead on the spot. This was not safe. We really should have walked out, and if V had a history of getting sick after ingesting gluten, we would have walked out. I felt extremely uneasy and unhappy. I debated going back in and talking to staff but decided against it. It was not their fault that they did not receive proper training. Needless to say, we will not be returning to this place again. Instant looser, big fat F! By the time we visited a third location, closest to our home, we adjusted our expectations. I scanned for a sign that we spotted at the first location about safe handling of GF orders. It was nowhere to be found. There was a different sign by the counter, a standard disclaimer that while GF ingredients are available, they may come in contact with gluten and that safety is not guaranteed. We asked the questions about ingredients, preparation and cross-contamination. First time ordering, staff seemed reasonably well-informed. They made V’s sandwich in the back; however not all ingredients were safe for her. Bacon was grilled on a shared grill. And they did not have uncontaminated avocados. On a second occasion, staff were less informed, though receptive to my requests. I had to ask them to prepare sandwich in the back. And when I noticed they used avocado out of a container at the counter that is used for all breads, spreading it with the same utensil, they had to start over with a different piece of bread. While I do appreciate that overall staff were more informed and accommodating here compared to the second restaurant, I think it’s completely worth it for us to drive just a little bit farther out to the first restaurant. This third restaurant gets a passable C+. Three branches of the same chain, three very different experiences. And moral of the story is to never assume and to always ask questions before ordering. Sometimes it ain’t easy being gluten-free. Disclosure: The Gluten-Free Media Group provided me with a complimentary admission to Gluten-Free Expo. All opinions are my own. Gluten-Free expo was amazing. So many different products to explore! I was quite familiar with some products and approached those vendors as a true fangirl. And there were many more that were either new to me or that I have not had a chance to sample in the past. All the swag! All the vendors! Without further ado, I present to you some of my favorites. These things are like crack. Seriously, you can’t eat just one. Very tasty and make great appetizers/party food. So many yummy things by this company that was completely new to me. See that chocolate cake mix? Tried it. Tastes amazing. So Delicious is so delicious. Also so blurry, sorry. Why yogurt, you ask? Isn’t yogurt normally GF anyway? Well, yes. I loved this for my own selfish reason. In my early twenties I developed mild lactose tolerance. A few years ago it got worse. Thank goodness I can still have cheese and most processed dairy products, as well as just a little bit of milk/cream. But I had to say good bye to yogurts and ice cream altogether, because doubling over in pain is so not worth it. So Delicious makes yummy coconut milk based yogurts and ice-creams. Trust me, I tried many and it’s not that easy to pull it off. Using the swag I brought back, I assembled V’s lunch later that day: a sandwich with BFree bread roll, So Delicious yogurt, and sun butter. The following day I decided to bring V along. It felt great to be able to tell her that she could eat everything. How often does that happen? Almost never. Some of V’s favorites were Sun Butter and Milton’s chips. Yum! So it’s lovely when everything is GF and I could say yes to everything. 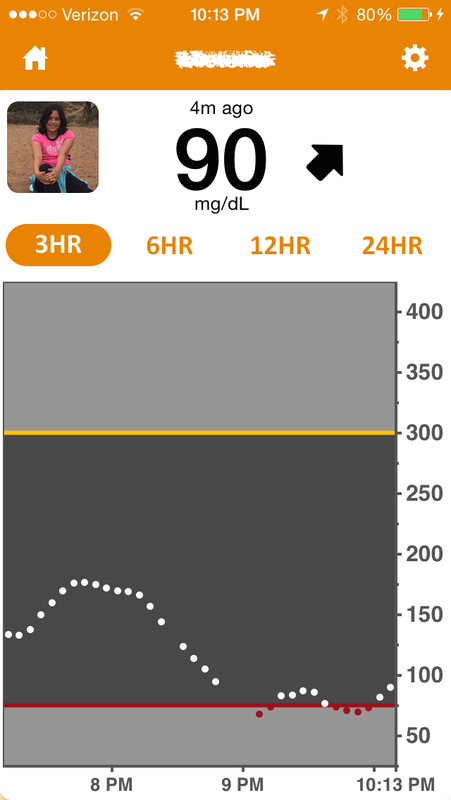 Except that stupid diabetes thing that did not agree with all of the sampling V had. We tried to estimate carbs best we could but ended up severely underestimating. Oops! We fixed it, using mainly insulin. For bonus points tell me at what time we arrived to the Expo? How were you able to tell? V was excited to assemble her lunch for the following day, using some of her favorite products. Last but not least, we got to try Keli’s Sauces. Sweet N Sour sauce was hands-down favorite. Not only is it delicious, it’s also pretty low in carbs, at 5 g per 1 TBS. V dips everything into it. It’s taken an honorable place alongside ketchup and it’s a place hard-earned. I can’t wait to go to the Expo next year and if I’m lucky I’ll make it to other Expos. I highly recommend you do the same. If you go, I have a pro tip for you: go hungry or else you won’t be able to get through even a fraction of samples. Also, you may not need another meal that day. Or ever. Disclosure: I received free samples for review. All opinions are my own. I’ve reviewed Arctic Zero frozen treats last year in this post. We like them because they have lots of great-tasting gluten-free flavors and are much lower in carbs than regular ice-cream. In the beginning of this year, the company unveiled new flavors and gave us an opportunity to preview and taste them. First, I have to give it to Arctic Zero for presentation. It’s so exciting when the box arrives beautifully packaged. If you don’t live near a store that carries Arctic Zero or does not have flavors you want, you can order online and they will ship it to you, too. Pro tip: don’t touch dry ice. Not even though a bag. Because OMG OUCH! We sampled the following gluten-free flavors: Cake Batter, Banana Pudding and Poppin’ Pomegranate. And we liked them all! As usual, everyone had their favorites. I didn’t think I’d like Cake Batter much but it turned out to be my favorite. V loved Banana Pudding the best. She was reluctant to try Pomegranate but liked it, too! Again, it’s helpful to remember that Arctic Zero treats are not like ice-cream. In their consistency they are more like less sweet sorbet. Disclosure: I received a free sample to try. I was not asked to write a review but volunteered to do it. 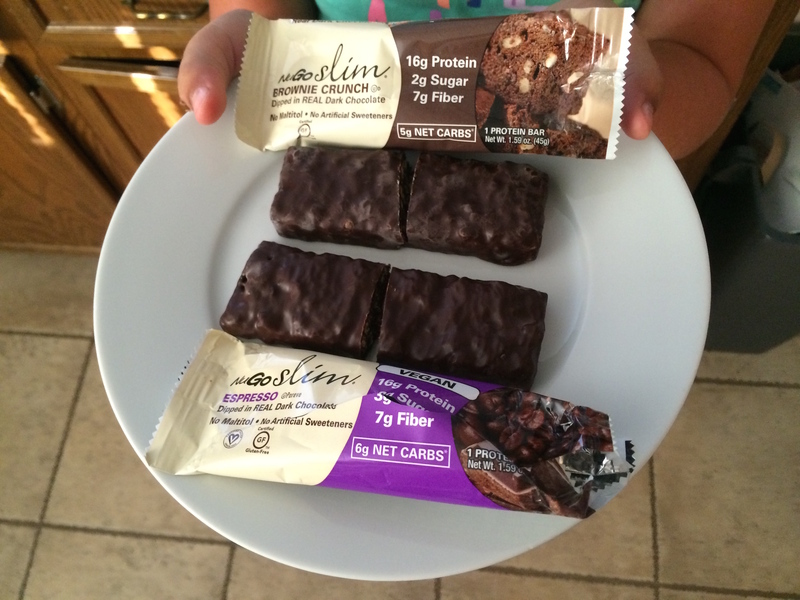 We are always on a lookout for good gluten-free protein bars. They are very handy as on-the-go snacks, given our active lifestyle. Just any bar won’t do: we look for a good mix of carbs and protein to better sustain both energy and blood sugar levels. Now, there are bazillion different protein bars out there. Finding one that is GF can be a challenge. Finding one that is GF AND does not have a bazillion carbs is a double-challenge. Finding one that is GF, reasonably “carby” and does not cost $5 per bar? Triple change. Finding one that is GF, reasonably carby, reasonably priced AND tastes good? Good luck. We’ve found a couple of favorites so far: Perfect Bars and Kind Bars are always well-stocked in our house. However, Kind Bars are rather nutty, shall we say. Perfect Bars are rather carby, and they fair best when kept at cooler than room temperature, so they are not the best thing to pack for a long day out and about. So when a NuGO rep contacted me and offered a sample of NuGO Slim bars, I was very eager to try them, as we can always use more good quality protein bars in our arsenal. Before I accepted the offer, I did some research. We are not interested in any foods that use artificial sweeteners. I was relieved to learn that NuGO products use real ingredients. Pass! We received a sample of several NuGo Slim flavors: Peanut Crunch, Espresso, Brownie Crunch, and Raspberry Truffle. All of them fit the bill perfectly in terms of carbs/protein ratio. They are around 17-20 g. of carbs and 15-17g. of protein per bar. However, they are also high in fiber, and if you remember anything from this post about what fiber does to carbs absorption, you may recall that when something has 5g. or more of fiber we subtract it from the total number of carbs. Therefore, most NuGo Slim bars are about 10 g. of carbs for us. I do not understand where the “Net Carb 6g” claim comes from – they must calculate it in a different way. We ignored it and calculated carbs the way we usually do it. Next up, price. If you go to the product shop on the website, a 12-pack costs $21 plus shipping. (Shipping is free when you spend $100). On Amazon it may cost a little more but it’s possible to get free shipping with Amazon Prime. Either way, the price is just under $2 per bar, which is pretty reasonable, and it falls in the middle of our two other favorites. Kind Bars are a tad cheaper; Perfect Bars are a tad more expensive. Now, I have not been able to find NuGO Slim bars in any stores close to our house. It looks like we would have to venture a little bit farther out to a store that we do not normally shop at. I haven’t had a chance to check prices and availability there yet. Of course we can always order online but I would prefer to buy a dozen bars of different flavors instead of committing to a 12-pack of one flavor. Last but not least, taste! V loved all of the flavors except for Raspberry Truffle. I really liked Raspberry Truffle but was not crazy about all other flavors. As usual, V and I tend to differ on what we like and dislike when it comes to flavors and textures. However, what I like is not really relevant because the bars are mainly for V, and she gave them an enthusiastic thumbs up. So, let’s go down our checklist. GF = check. Reasonably carby = check. Reasonably priced = check. Tastes good = check. We have a winner! Disclosure: I received complimentary frozen desserts for review. All opinions are my own. Ice-cream is our frenemy. It tastes so good, especially on a warm summer day. V loves it. There are many gluten-free varieties and it’s a dessert we can say “yes” to. And yet, ice-cream is rather evil. It may be Celiac friendly but it is definitely not diabetes friendly. We carefully weigh and measure it, give the correct bolus, extend the bolus, give extra insulin, but no matter what we do it always wins. Invariably, V’s BG goes up and stays high. Since oftentimes V likes to have ice-cream after dinner, we end up correcting highs in the middle of the night. Sugar-free ice-cream, you say? Thanks but no thanks. We try to avoid sugar substitutes in our household. While we allow V to have a diet beverage when we are eating out, we don’t keep any diet products at our home. But it is possible to have your ice-cream and eat it too, so to speak? Arctic Zero makes it possible! It is a local company making low-glycemic frozen dessert treats. They use non-GMO, real ingredients without diet products nonsense. It is free of several other things: lactose-free, fat-free and gluten-free. When I see all this “free” labeling, I wonder right away if it is also taste-free, so we were really excited to sample some of the desserts and see for ourselves. We received a six-pack of pints: orange cream, simply strawberry, cool mint chip, buttery pecan, vanilla maple and cookie shake. V immediately tore into the cookie shake pint. It’s been two years since she was able to have that flavor and yes, Arctic Zero has a gluten-free version of it. She loved it. Over the course of a couple of weeks we slowly ate through all the flavors. V loved all of them except for orange cream. Interestingly, orange cream was my favorite, along with simply strawberry and cool mint chip. If you are expecting a true ice-cream substitute, you may be disappointed. 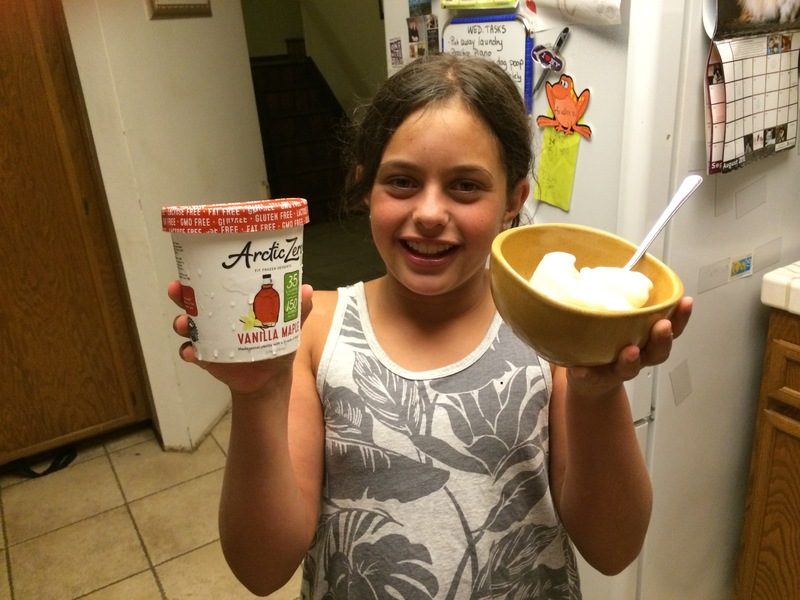 Arctic Zero has a consistency and texture that is more similar to sorbet, and is also a little frothy when melted. I personally am not a big fan of the frothiness, but in fruit flavor desserts it did not bother me. In other flavors, I found the texture to be a turn-off. V did not seem to care one bit about texture, and no one minded less sweetness. The only reason V did not like orange cream flavor was because to her it tasted like “orange peels”, which is her complaint about all orange-flavored ice-creams. All the other desserts were a huge hit. V is smiling for two reasons. First, yummy! Second, she got a full cup of ice-cream. Normally, she gets only half a cup, as regular ice-cream averages 25g of carbs per half a cup. And it’s enough to wreak havoc with her BG. Average sorbet has close to 30g of carbs per half a cup. Arctic Frozen desserts are only 7-10g of carbs per half a cup, so we felt OK saying yes to a full cup. And guess what? Her BG was a beauty. BG of 90 after ice-cream? Yes, it is possible! You may be wondering about how expensive this product is, since is full of so many magical ingredients. I wondered the same thing. You can buy a 6-pack directly from website and it will arrive to your doorstep lovingly packed in dry ice, for a cool price of $46.02 including delivery. That’s about $7.66 per pint, not cheap. Depending on where you live, you may also be able to find it in a local supermarket, although flavor options may be very limited. On the website, you can plug in your zip code and it will tell you if any nearby stores carry it. There are several stores around us that cary Arctic Zero. I stopped at one that is closest to us, and it tends to run on a more expensive side, and the pints there were selling for $5.29, on par with other brands of ice-cream. Now, it is still rather pricey, and honestly who buys pints for a family? However, as a special treat I think it is reasonable, and we are happy to have found a diabetes-friendly frozen treat option. It may not be a true ice-cream substitute, but it is good enough. Disclosure: I received a complementary Genteel lancing device for review. All opinions are my own. A lancing device that is painless and can be used on body sites other than fingers, for a cool $129? Yeah, right. And, no way. Lancing devices are really cheap, typically under $15. 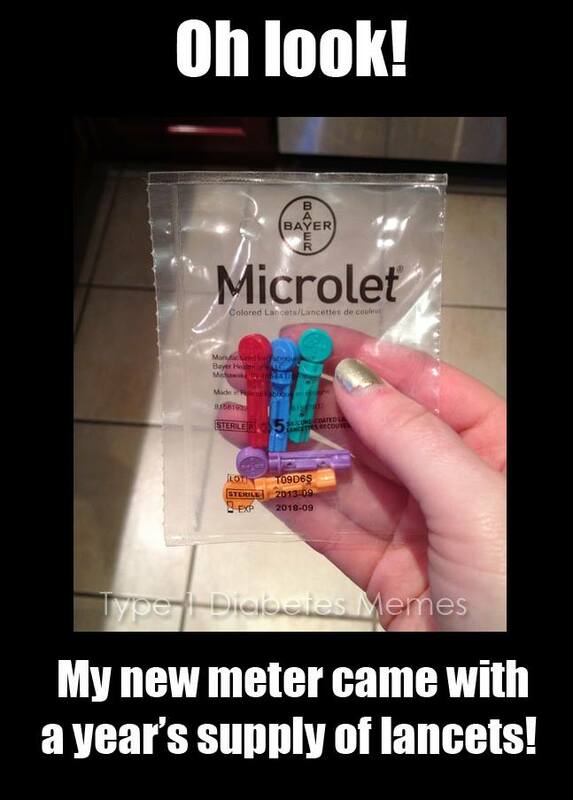 Many of them come free with meters. V does not find lancing painful or has a fear of needles. 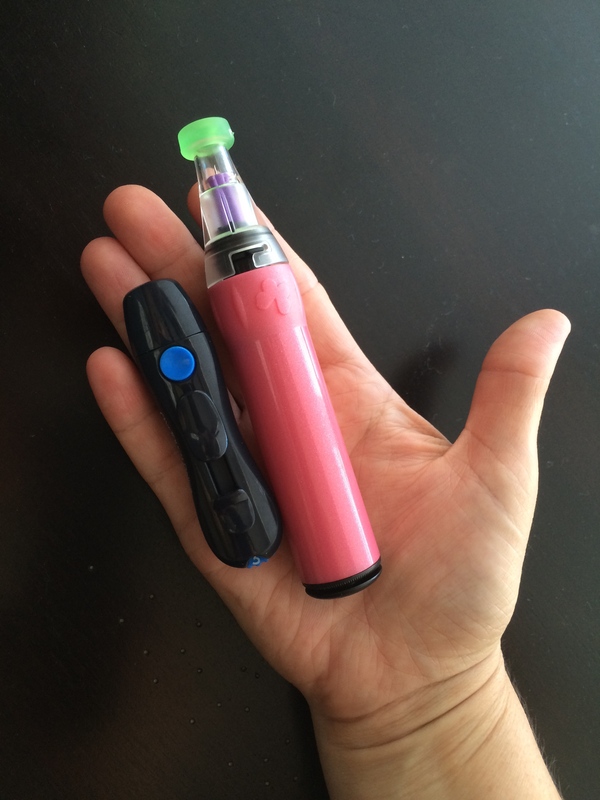 Besides, our trusty lancing device is cute, little and super easy and convenient to use. So why in the world would we spend all this money on a device double the size of ours, costs a gallon worth of premium blood, and is something we don’t really need in the first place? Thus, when I agreed to review Genteel, I approached it with a healthy dose of skepticism. However, truth be told, I was also very intrigued. Can it deliver what it promises? Is it really pain free? Even more so, can it really be used to accurately test BG using other body sites? After two years of poking her fingers 8-10 times a day, V’s little fingertips are like pin cushions. While she does not find lancing painful per se, she does feel the pricks, and it can be uncomfortable. She tends to over-use some fingers, and it would be really convenient to use alternate testing sites to give her fingers a break. With that in mind, V and I eagerly took to test-driving Genteel, with the goal of giving it a thorough workout. I won’t bore you with the details on how Genteel works, what it comes with, or other specs. The product website has all of this useful information and more. I’m going to jump straight to our experience with this device. There was definitely a learning curve at first with assembling the device and figuring out how to use it properly. I had to remember to push the activation button long enough and then to release it before breaking contact with skin. I also had to remind myself to keep my fingers off of the push cap. After I felt comfortable using Genteel and could vouch to V that I really did not feel any pricking, it was time for her to try it. (Please note: Genteel is designed for single user only. Because I’m a rebel, I broke the rules and used it for both of us. I made sure to carefully clean and disinfect nozzles and contact tips before testing my daughter.) She enthusiastically took to the task and I have to admit that she learned to use Genteel a lot quicker than me. Happily, she declared it to be pain-free! We stuffed it into V’s OmniPod case and began using it as our main lancing device. Does it fulfill its promise of painless lancing? In our experience, yes. We both tested BG on fingers, arms, shoulders, above the knee, and on other body sites, with good success. There is a catch, however. Unlike regular lancing devices that have a dial to change the strength and depth of lancing, Genteel uses different contact tips that need to be fitted on a nozzle. It is definitely trickier and it is not practical to change the tips back and forth. You need to figure out which contact tip works best. The blue tip, the most gentle one, worked great on fingers. However, it was not strong enough to draw blood on alternate sites. The green contact tip painlessly drew enough blood on alternate sites but was not painless on fingers. It was not exactly painful, but it felt more or less like a regular finger prick. Genteel does come with two nozzles, so you can put a different tip on each nozzle and change nozzles when needed, which is a lot easier than changing contact tips. Still, we are so used to the ease of turning a dial that carrying a different nozzle and having to change it depending on where we want to test was unappealing to us. So we came up with a compromise: V settled on a green contact tip, given that our main objective was to use Genteel on alternate sites. We still carry our regular lancing device if we want to test on fingers, although we can also use Genteel but not expect it to be completely painless. Also, pro tip for you: do not use Genteel without a contact tip. Because OMG OUCH! Technically, Genteel is supposed to work with any square-shaft lancets. However, the website provides a list of lancet brands that work best as well as those that are not compatible or do not work as well. We did get good results when using lancets recommended by the company. When we tried to use Abbott brand lancets, even though they fit properly, we could not draw blood reliably, so we tossed them and are sticking with the One Touch brand. 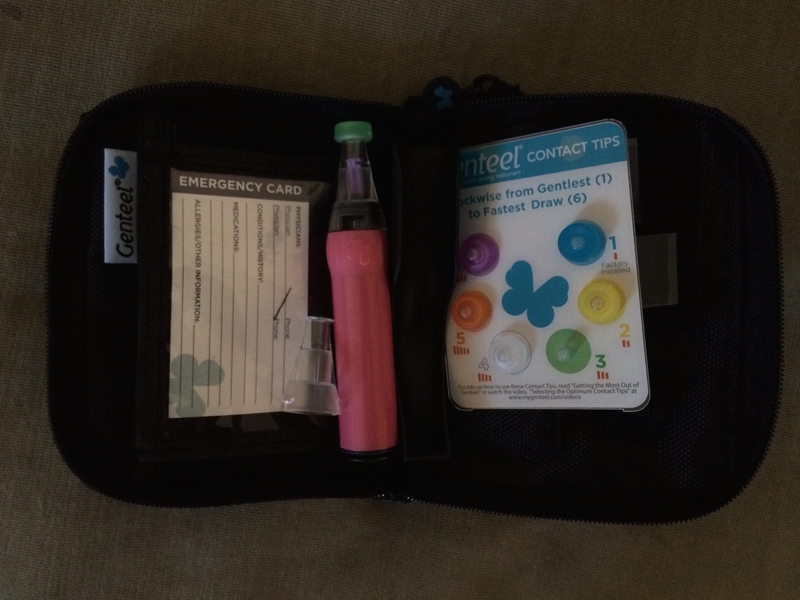 Speaking of tossing the lancets… Genteel does not have a function to eject used lancets. I am not a big fan of manually pulling lancets out and for the life of me I can never keep the little round lancet tips that you are supposed to put back on before pulling lancet out. They end up on the floor or just magically grow legs and run away. With our regular lancing device we are were pretty diligent about changing lancets right away. With Genteel, pretty quickly we decided it was not going to happen. I change the lancet about once a day now, even in our old device. Eh, if you can’t beat them, join them, right? As long as the lancet is working well, we are not going to worry about it too much. Another thing I found myself doing at least once a day is rinsing nozzles and contact tips. Blood smearing on the inside of nozzles and contact tips is inevitable. Instructions purport that if you use Genteel properly it won’t happen. Ha, welcome to the real world! Sometimes our technique is not perfect. Other times we think it’s perfect but blood smears still happen. The nozzles are clear so you can see right away if there is blood on the inside. It does not present any safety issues or affect function, so it’s more about how grossed out you will get. We hope Genteel holds up for a while. We are not gentle with our gadgets, and I would expect it to withstand all kinds of abuse if it’s meant to be used for and by kids. Within the first few days V did something to it and it literally fell apart. Nothing was broken, my husband was able to put it back together, and it’s been fine ever since. The company offers a 120-day money back guarantee for any reason, and a manufacturer’s limited 5-year warranty after that. All the shortcomings notwithstanding, we grew rather fond of our Genteel after only two weeks of using it. Yes it’s bigger, but it is still small enough to fit in V’s pump case. Yes it’s a little different and awkward at first, but we got used to it quickly. Yes it’s expensive, but we think it’s worth it. It is painless, which is awesome. Even more awesome is our newfound freedom to use alternate lancing sites. We test V’s fingers only a couple of times a day now, at most. And the convenience of being able to draw blood easily and painlessly from other body sites can’t be beat. We love it at the park, where V’s fingers get completely filthy but her tummy is nice and clean. 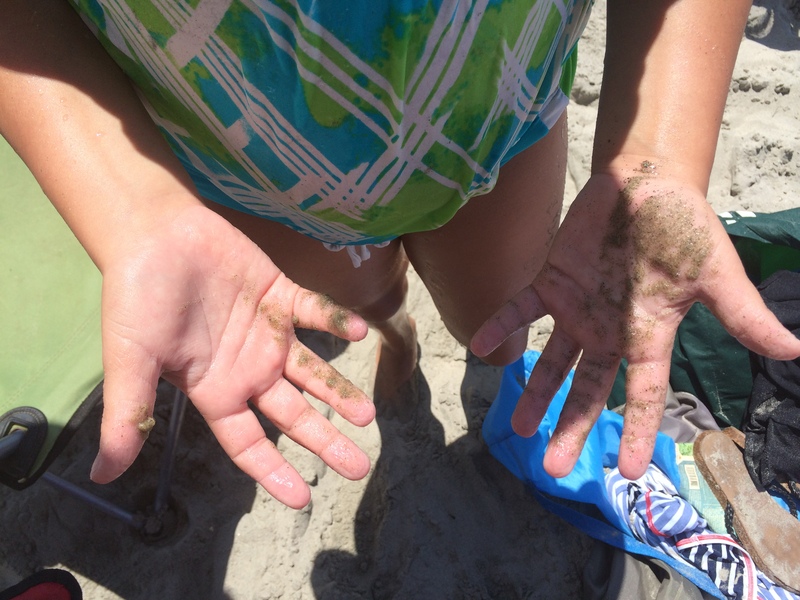 We love it at the beach, where fingers are always sandy and wet, but we can just wipe off a little spot above the knee or on the arm. I also love it for nighttime checks because I no longer have to dig out little fingers from underneath a pillow or ten layers of covers. I even totally replicated the idyllic experience depicted on a website photo, where a Mom is testing her unsuspecting soundly asleep child by lancing her shoulder. Our more realistic version of a night-time BG check. Less idyllic, more frazzled and tired. No gigantic stuffed animals were harmed during this photo shoot. 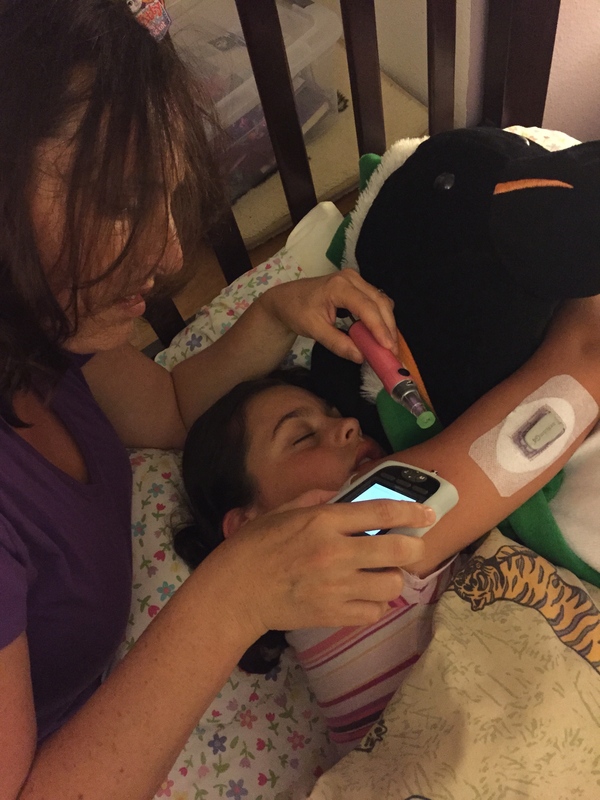 Now that it’s been warmly accepted into our diabetes gadgets family, perhaps it’s time for V to decorate her Genteel with stickers it came with. P.S. Do you have any questions about Genteel that my review did not cover? Please ask in comments. I could not possibly fit all the info I wanted to include in this post, as it’s already quite a beast in length. Write a post documenting what you eat in a day! Feel free to add links to recommended recipes/shops/whatever. Make it an ideal day or a come-as-you-are day – no judgments either way. The last few posts were heavy on deep thoughts. Screw that. Let’s eat! I took notes and pictures all day Tuesday to document one of our typical days. 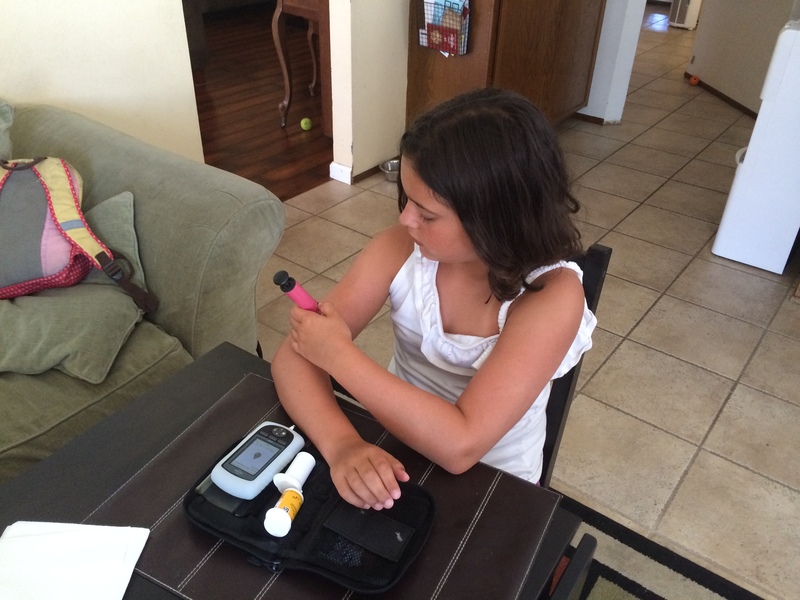 Without further ado, here is a glimpse into our everyday T1D and gluten-free eating. On Tuesday V asked for cereal for breakfast. 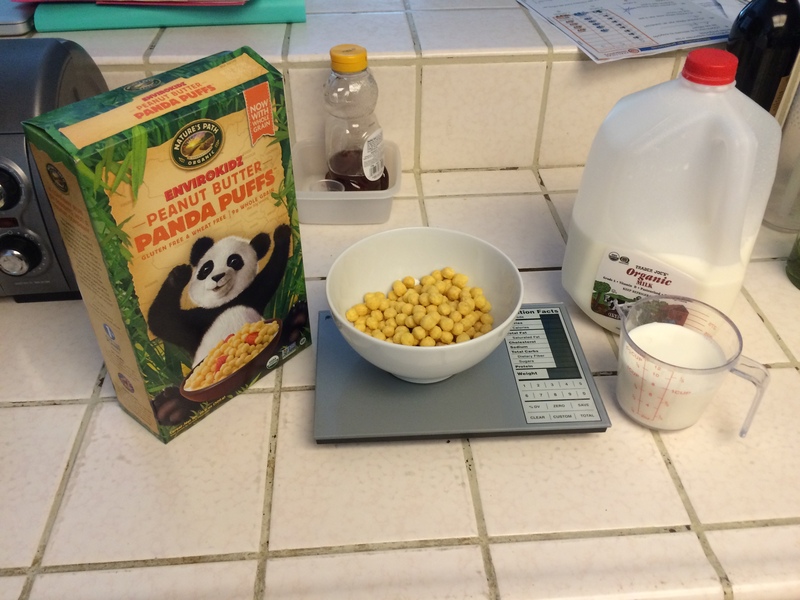 Panda Puffs is currently her favorite, and it’s not too terribly sugary as far as cereals go. She got two servings (1.5 cups total) for 46 g. plus one cup of milk for 11 g., for the total carb count of 57 g.
By the way, weighing cereal is definitely the way to go. Much easier and more accurate than measuring it. Her school lunch box is next. It’s often a sandwich with a few different sides/snacks, always including a couple of carb-free options. 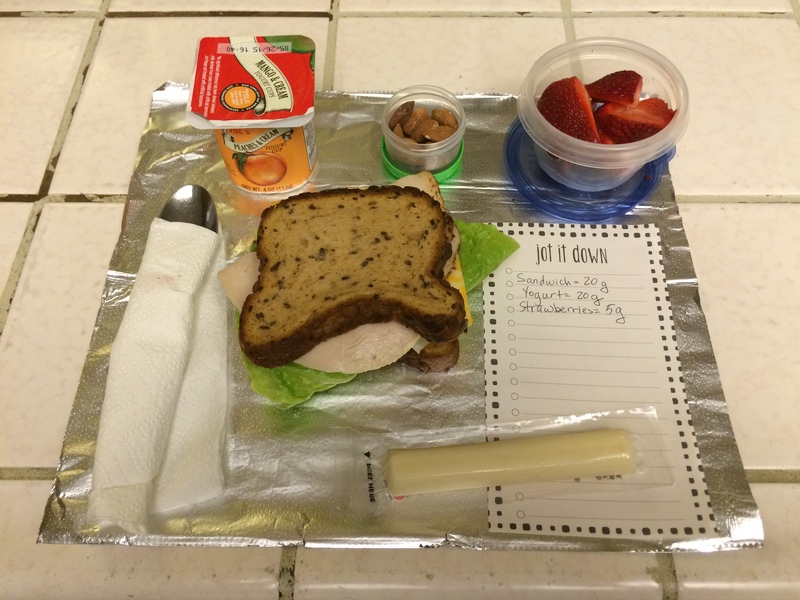 Here we have a turkey and cheese sandwich with The Essential Baking Company GF bread for 20 g., yogurt for 20 g., and 1/2 cup of strawberries for 5 g. Sting cheese and a handful of almonds are “free”. We always itemize V’s lunch so that she can pick and choose what to eat when. Our family meals are always gluten-free. Since both my husband and I work outside of home and kids have a bunch of after-school activities, we rarely have the luxury of having much time to prepare a meal after work. However, eating gluten-free means that we have to cook more and rely less on prepared or processed foods. That’s great for our health but can be stressful and challenging. We have to find recipes that allow us to make quick meals from scratch or from semi-prepared foods. It also really got me into crockpot cooking, because there is nothing better than food cooking itself and a hot meal waiting for you when you get home. 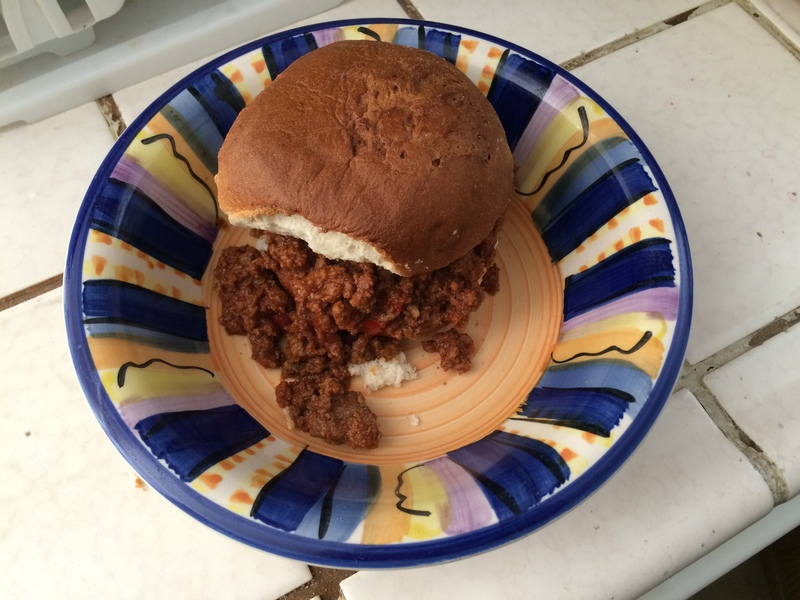 That night, we had Sloppy Joe’s on the menu. (Another thing that makes our lives easier is making a menu for lunches and dinners every week, so we shop and prepare ahead.) I used this recipe from Udi’s with a couple of minor modifications. I used ground beef only because that’s what we had, although last time I used a combo of ground beef and pork sausage and it was really good. We do not like the taste of food that’s cooked with fresh onions in the crockpot, so I only used onion powder. I also ran out of chili powder so I used some cajun seasoning instead. And I added a bit of chili sauce for good measure. It turned out finger-licking good! 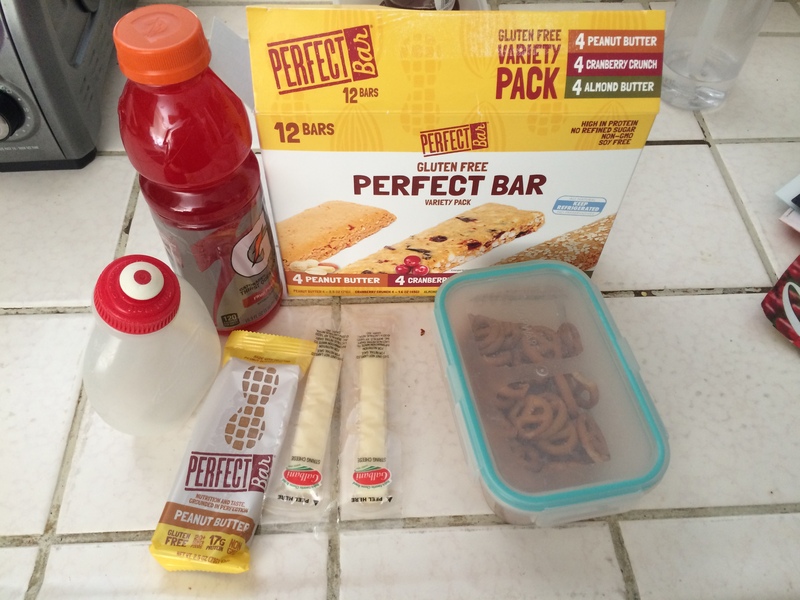 Last but not least, here are the snacks that I took for V to BMX: Gatorade to keep the lows at bay, Peanut Butter perfect bar for a hearty snack (way easier than making a PB&J sandwich), string cheese for a carb free snack, and Gratify gluten-free pretzels. One neat thing about these pretzels, besides the fact that they taste great, is that a serving size of 23 pretzels is 22 g. of carbs. Quick and easy math tells us that it’s about 1 g. carbs per pretzel. 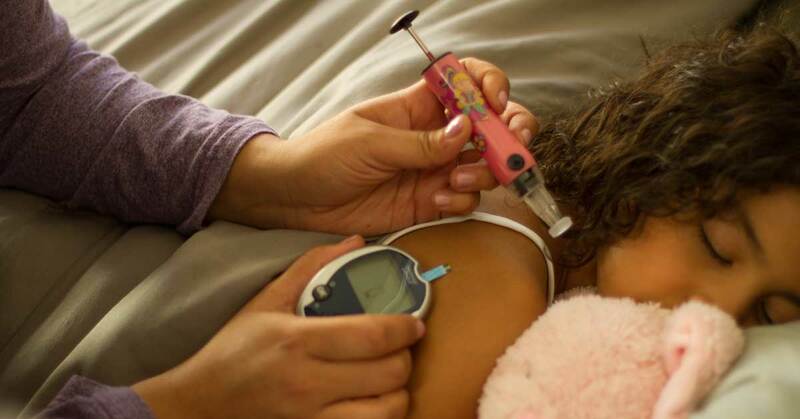 It makes it so easy to bolus for them – no need to weigh or measure, just count how many you want to eat and bolus. In case you are wondering, aside from pretzels that we buy on Amazon, everything else came from either Costco or Trader Joe’s.